There is a new smartphone coming to market, running on a new operating system. It’s an all-touch device — with no physical navigation controls and no physical keyboard — and serves as a platform for third-party apps. It’s meant to compete in a world defined by Apple’s iPhone and Google’s Android phones. It’s a BlackBerry, reinvented from the ground up. This model, called the Z10, and its operating system, called BB10, are bet-the-company moves by BlackBerry maker Research In Motion. RIM has seen its once-dominant position in the market shrivel away, especially in the U.S., since the iPhone appeared in 2007. It has tried a couple of times to drop its famous physical keyboards for touchscreens, but those projects failed, partly because the old BlackBerry operating system was primarily designed to handle corporate email and was a poor platform for app developers. 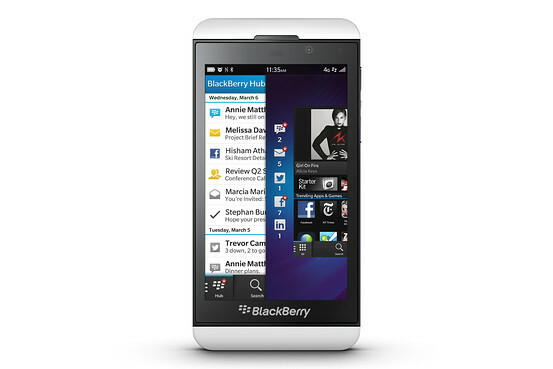 The BlackBerry Z10 comes in black and white and looks very different from past BlackBerrys. Now, RIM is hoping that BB10 can change all that, so much so it’s changing its name to BlackBerry. The new OS, which is the most important part of the product, isn’t an evolution of the old BlackBerry platform. It is a clean break. 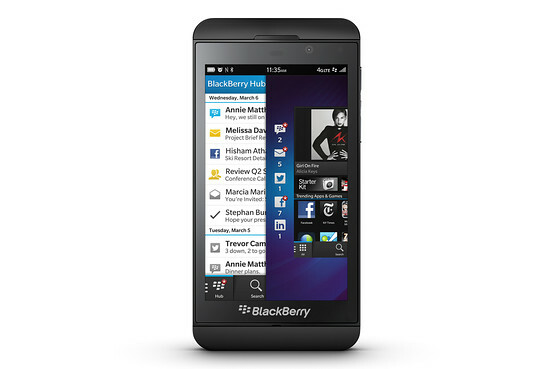 Its user interface is so different that it will seem foreign to longtime BlackBerry users. And the first phone to use it, the Z10, looks much more like its rivals than like traditional BlackBerrys. I’ve been testing the Z10 for about a week and decided to approach it as a new entry from a new company, because it is so different from past BlackBerrys. Overall, it worked fine in my tests, but I found it a work in progress. I liked some things a lot, including the way BlackBerry has designed its new virtual keyboard and camera, and the way it gathers all your messages into a single Hub. But it will launch with just a fraction of the apps available from its competitors, and is missing some very popular titles. It also lacks its own cloud-based ecosystem for storing and sharing files, like Apple’s iCloud or Google Drive. And there are other missing or lagging features. Fervent BlackBerry fans might shun the Z10 for its lack of a physical keyboard, while fervent iPhone and Android fans might shun it for its small selection of apps and lack of native cloud services. BlackBerry is formally announcing the Z10 and BB10 this week and it will go on sale in some countries almost immediately. In the U.S., all four major carriers are expected to sell the phone, for $199, according to BlackBerry, but the company estimates it won’t be available until March. A second BB10 phone, the Q10, due in April, may be an easier transition for BlackBerry addicts, since it will have a physical keyboard. But BlackBerry sees typing on glass as its future and will be emphasizing the touch model. The Z10 is basically a chunky plastic slab, midway in size and weight between the tall, slim iPhone 5 and the bigger, wider crop of new Android models. I found it felt good in the hand. Its high-resolution 4.2-inch screen is a bit bigger than the iPhone’s 4-inch display, though much smaller than many newer Android screens, which are creeping toward 5 inches. 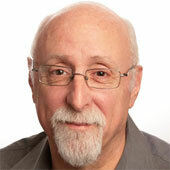 The rear camera is the same eight megapixels as on the iPhone and Android models like Google’s flagship Nexus 4. It comes in black and white, and has only one memory configuration — 16 gigabytes (the base on the iPhone) — but the memory can be expanded by up to 32 more gigabytes using a removable card. Unlike many phones today, it has a removable battery. The Z10’s virtual keyboard is fast and easy to use, partly because of its predictive typing. You unlock the phone by swiping up from the bottom border. The phone displays the last screen you were on. A similar swipe from any screen will take you to the home position, which displays minimized versions of up to eight apps currently running, with each displayed as a large rectangle showing some information from the app, such as weather or appointments. These are called Active Frames. From there, swiping to the left takes you through screens of app icons, similar to those on Apple and Android phones. Swiping from the bottom minimizes any open app into an Active Frame. I found these gestures easy to use and remember. Although it isn’t technically the home screen, BlackBerry expects most users to spend most of their time in the device’s unified inbox, called BlackBerry Hub. To reach the Hub, you swipe right from the display of running apps, or, if you’re on any other screen, you swipe up and to the right in a curved gesture from the bottom border — that one takes a little practice. The Hub contains emails from all the accounts you’ve set up on the phone, as well as text messages, messages from the company’s BlackBerry Messenger service, and even updates from Twitter, Facebook and LinkedIn. Unlike on older BlackBerrys, there aren’t separate icons for various email accounts; they are visible only via the Hub. But you can swipe right from the Hub to see each account and view only its contents. If you swipe down while in the Hub, you see upcoming calendar events. 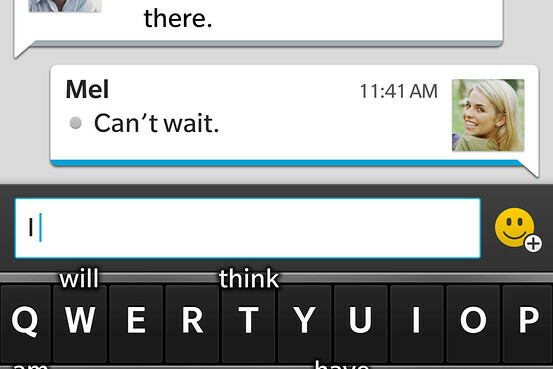 The Z10 keyboard is the best and fastest out-of-the-box virtual keyboard I’ve used. Master BlackBerry thumb typists might not find it as fast as the traditional physical keyboard, but, for a one-finger typist like me, it was faster and more accurate than either the native keyboards on the iPhone or Android. This is partly because it features predictive typing. It displays words that are likely to come next right above the rows of letters, and lets you flick these words upward into the text you’re composing. It learns what mistakes you typically make in hitting letters, and adjusts. And it learns words and abbreviations you frequently use, even proper names. BlackBerry claims it will have 70,000 apps at launch. Others are promised shortly afterward. That sounds like a lot, but Apple is approaching 800,000 and Android has over 700,000. BlackBerry’s app store, called BlackBerry World, includes—or will soon include — some common and standard apps, such as Facebook, Twitter, Angry Birds, The Wall Street Journal, the New York Times and Major League Baseball. But at launch, it will be missing Instagram, Pandora, Spotify, NPR, Google Maps and Netflix, among many others. If you use a corporate network controlled by an IT department, and want to keep your work and personal apps separate, BB10 has a simple way to do it. You just swipe down and press a button called “Personal” or “Work” and the apps, and even the background, change. However, email and calendar entries are still intermingled. The camera has a cool feature called TimeShift that allows you to adjust individual faces in a group shot to get different views of them — say, smiling instead of frowning — by capturing additional images just before or after the snapshot. Voice calls were excellent. I didn’t do a formal battery test, but in my moderate to heavy use of the phone, I found it didn’t last as long on a charge as the iPhone 5, and began to get pretty low by late afternoon. It would last some people an entire day, but not everyone. I found the browser adequate, but noticeably slower than the standard Apple and Android browser, even on a fast Wi-Fi network. However, unlike on many phones today, the browser supports Adobe Flash on some pages, if you manually enable it. The Z10 is capable of using LTE networks, the most consistently speedy available. But on my test unit, which was running on AT&T, I could never achieve download speeds of more than a paltry two megabits per second, even though the phone said it was on LTE, which typically sports download speeds of 15, 20 or even more Mbps. BlackBerry had no explanation for this anomaly. In BB10, BlackBerry has added a video-chat feature similar to Apple’s FaceTime. In my tests, this worked well. Unlike Android or Apple devices, BB10 has no built-in cloud system for syncing or storing photos or other data. BlackBerry says that the third-party cloud app Box, which is mainly used by corporate customers, can do some automatic syncing, but it says it plans to work on its own system over time. There is no native ability to print from the Z10. And in some cases, I found that common controls required too many steps. For instance, to quickly get to the top or bottom of a long list of messages in the Hub — something the old BlackBerry did with ease — you have to go to the menu. BlackBerry says it is working on making that quicker. The Z10 and BB10 represent a radical reinvention of the BlackBerry. The hardware is decent and the user interface is logical and generally easy to use. I believe it has a chance of getting BlackBerry back into the game, if the company can attract a lot more apps. 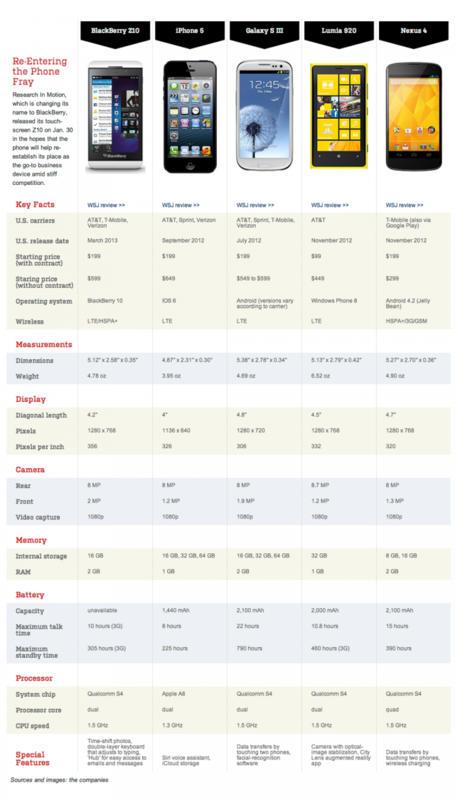 A comparison table of the BlackBerry Z10 with its competition in the smartphone marketplace.